During August I try to slow down my summer activities and I enjoy staying home and working in the garden. After a hard-working day in the yard, I reward myself with a homemade ginger limeade. 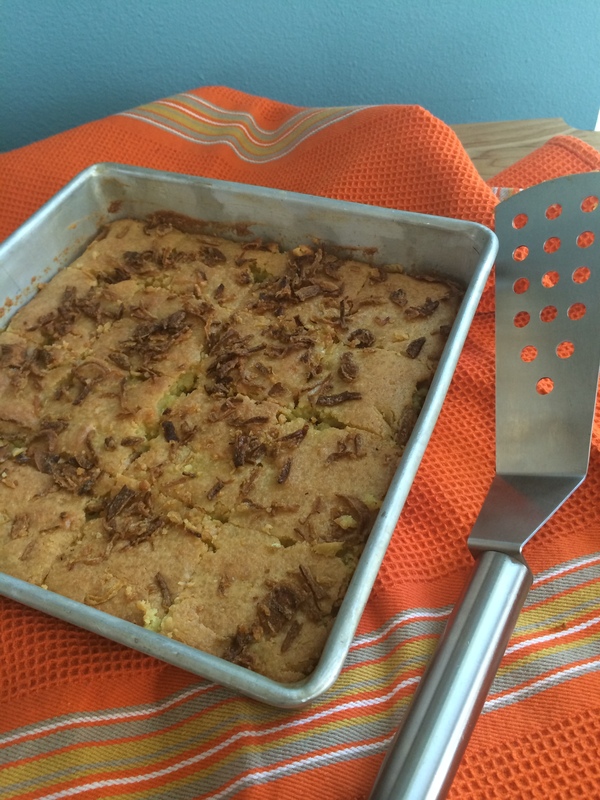 This recipe is used often in summer cooking classes for kids. This week it worked out perfectly for me to test the recipe one more time before sharing it with you and savor the results at the end my gardening day. I planned ahead to have the freshest limes and ginger on hand, then I made the limeade in the morning so all the flavors would have a chance to blend and chill to the highest delight. Thai cuisine depends on lime flavor. It is in almost in every dish. One should always have at least half a dozen limes on hand. Crush the ginger until juicy and softened before adding it to the pot of sugar and water. 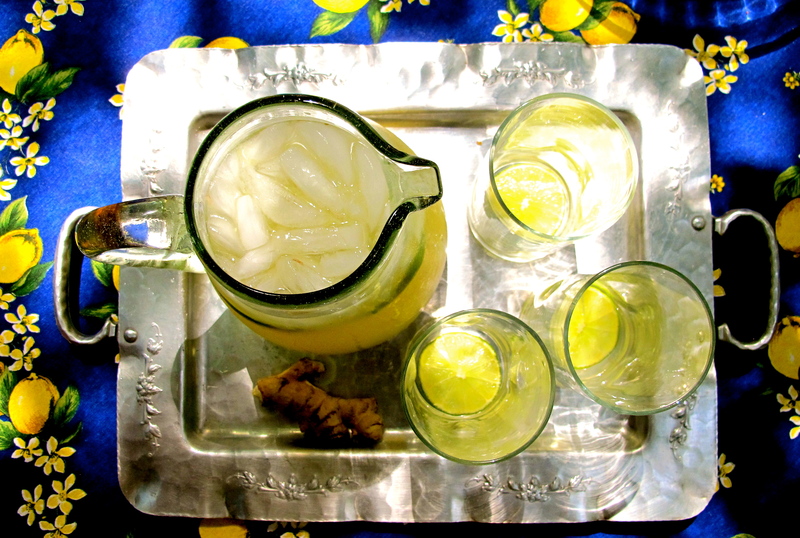 Before you put together the ingredients to make ginger limeade, I would like you to follow closely my culinary insight on how to make ginger infused simple syrup. I didn’t make this technique up, it has been in my family for a long time. Infused fresh ginger provides a different flavor than dry powdered ginger or the fried ginger used in savory dishes. 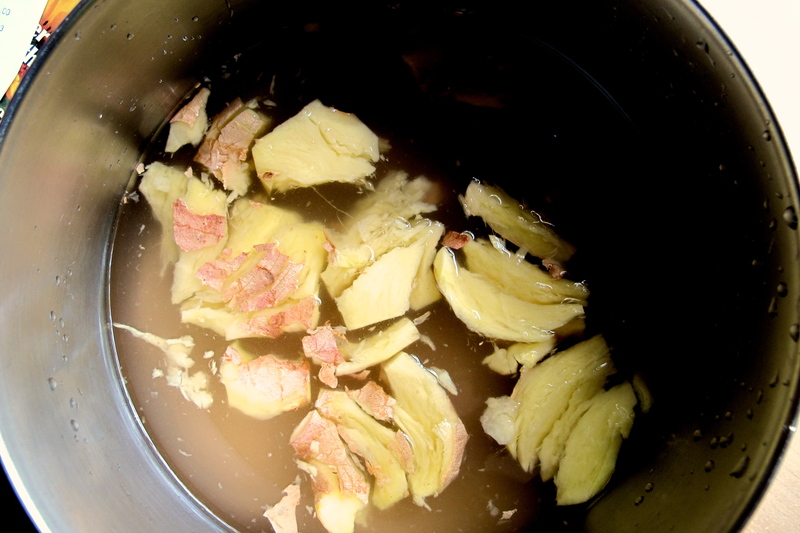 Crushing the ginger until the juice comes out helps break down the ginger’s cell walls. Thais use smashed ginger in a simple syrup for many dessert dishes. 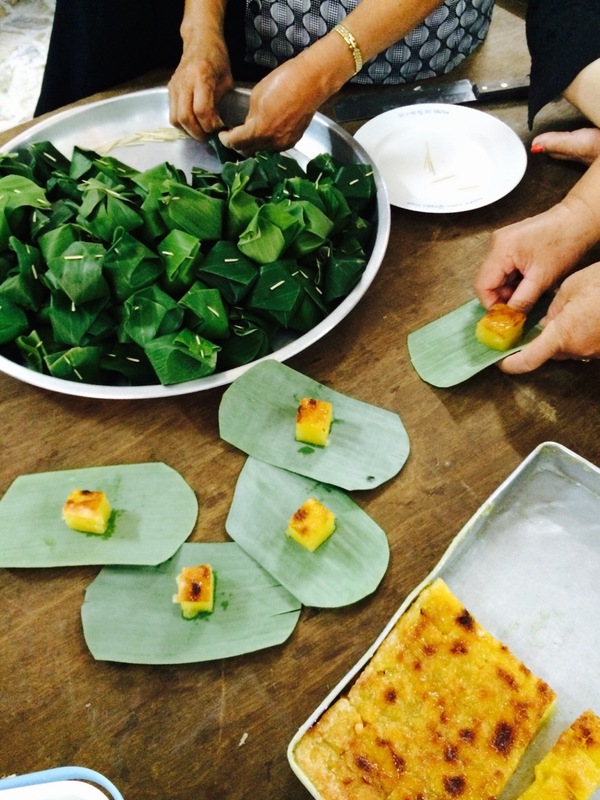 The aroma and taste of fresh ginger syrup is the first entry to sweet dishes such as Bua Loi Nam Khing (glutinous rice ball in sweet ginger syrup). I add ginger syrup to my limeade for a refreshing drink to enjoy in the hot summer or with a Thai meal. To make the brown sugar-ginger syrup, bring water, ginger and sugar to a boil in a medium-size pot. Let it boil on medium heat for 15 – 20 minutes. Remove ginger and strain. After it has cooled to room temperature, stir in lime juice. Set aside enough lime slices for six glasses of limeade, then add remaining lime slices to a nice pitcher and pour in the limeade mix. Chill overnight, or for at least 6 hours. Before serving, add 2 cups ice cubes to the pitcher and stir. Fill six tall glasses with ice cubes and garnish each with a lime slice before adding the limeade. To peel or not to peel? Peeling ginger is a personal option. I prefer to just peel off any tough skin or bruised parts. Ginger is abundant in Thailand. It is reasonably priced and I always had some at home, fresh and in the freezer. 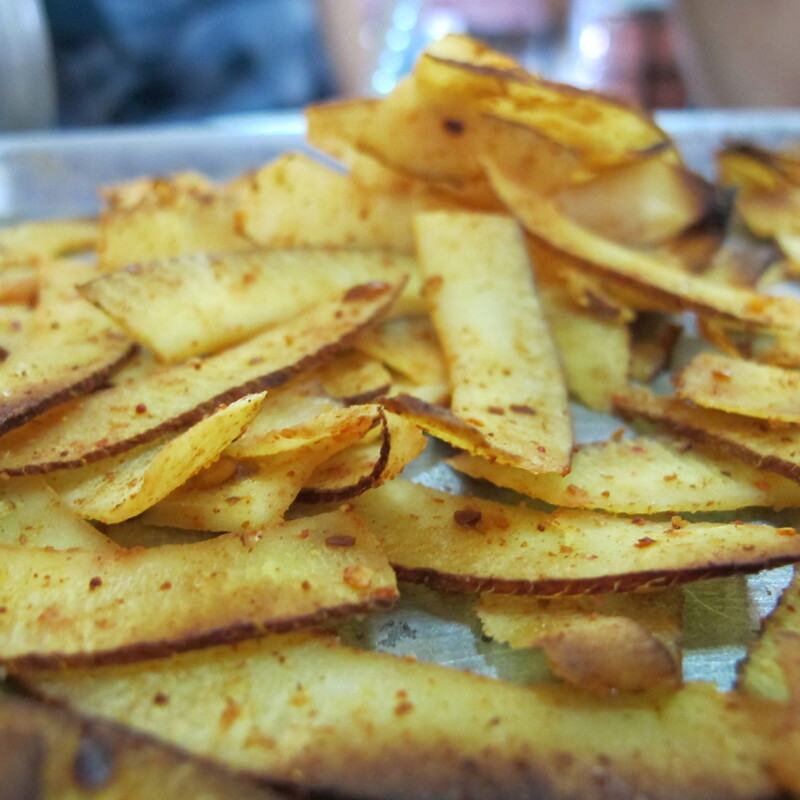 When I was in Thailand exactly a year ago, I created this recipe – Spicy Thai Coconut Chips. 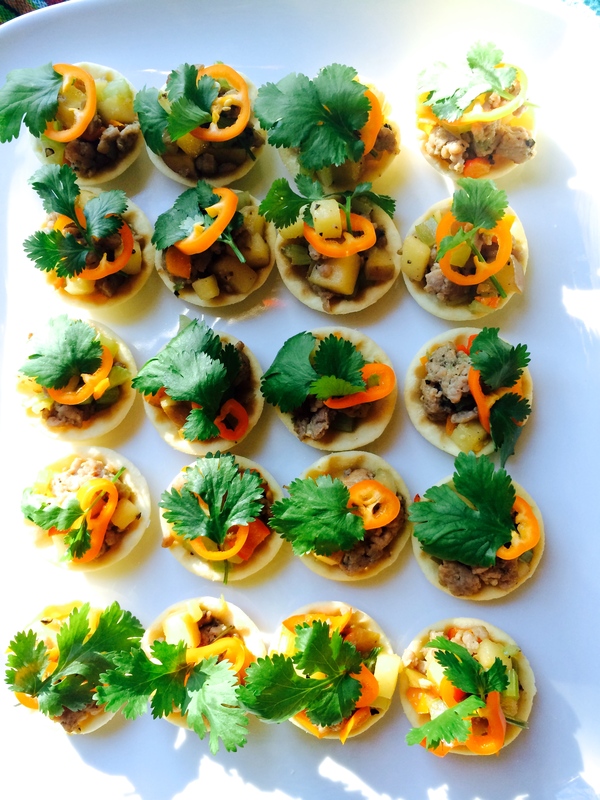 I wanted to create delicious snacks for upcoming cooking demo. At the same time I wanted the flavor to reflect my Southern Thai cuisine, specifically my grandmother cooking. After receiving a reminder to send in recipe from Seattle office, I went to my mom kitchen and cook with my family. This was a same day I wrote and recorded a mystery dish from Southern Thailand – Stir-fried Fresh Grated Coconut with Phuket Curry Paste. It was a perfect day. I was lucky that my sister in-law – Tim was there. After she prepared the old forgotten dish of stir-fried fresh greated coconut with Phuket curry paste, I created new modern dish to reflect this flavor for the new generation. It is not often that I cooked for my family in Thailand. They were impressed seeing a recipe developer at work. I used my grandmother’s favorite spice, turmeric. I added more spice and other ingredients to create the balance of flavor of sweet, sour, salty and spicy. And my whole Thai family was excited with familiar texture and flavor from the coconut chip that was bake in my sister small oven. I hope you enjoy the step-by-sttep photos and recipes below taken and created in my mom’s kitchen in Phuket, Thailand. Have a great spicy Thai crunches! 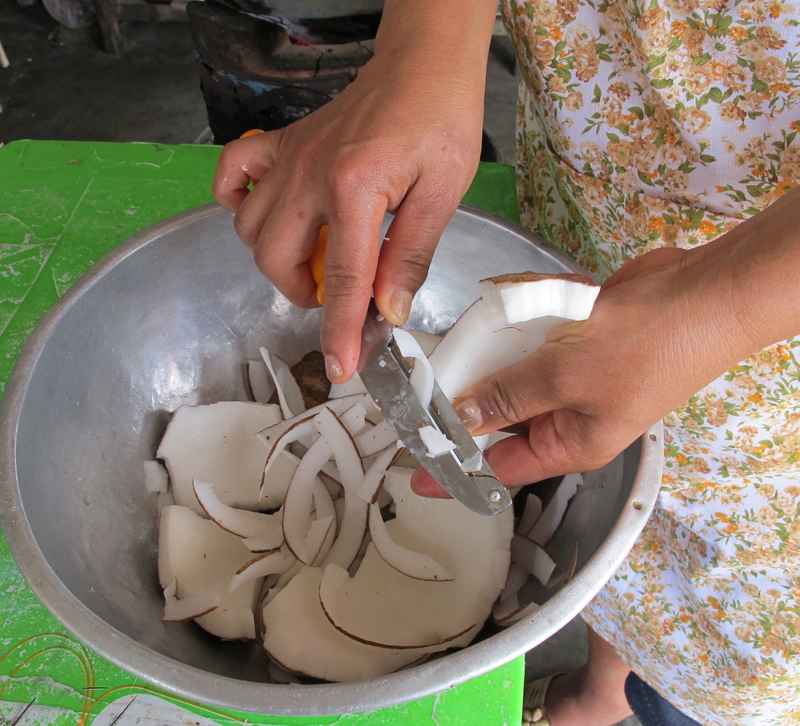 First sliced fresh coconut with peeler, you may use dried coconut chips in a package. The cooking time may vary. 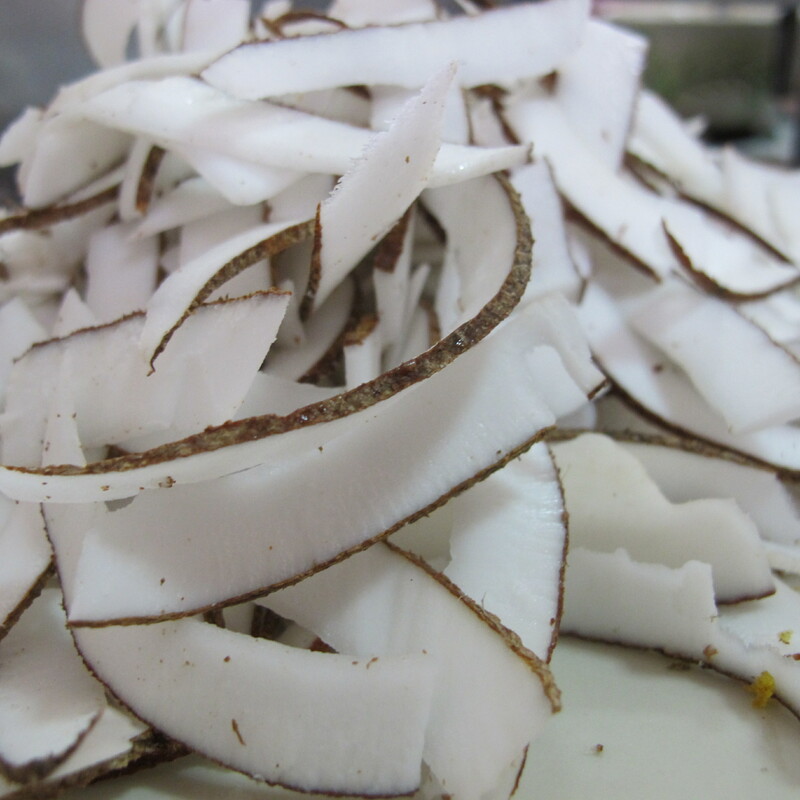 Dried coconut chip is accessible and easy to prepare and it has longer shelve life. 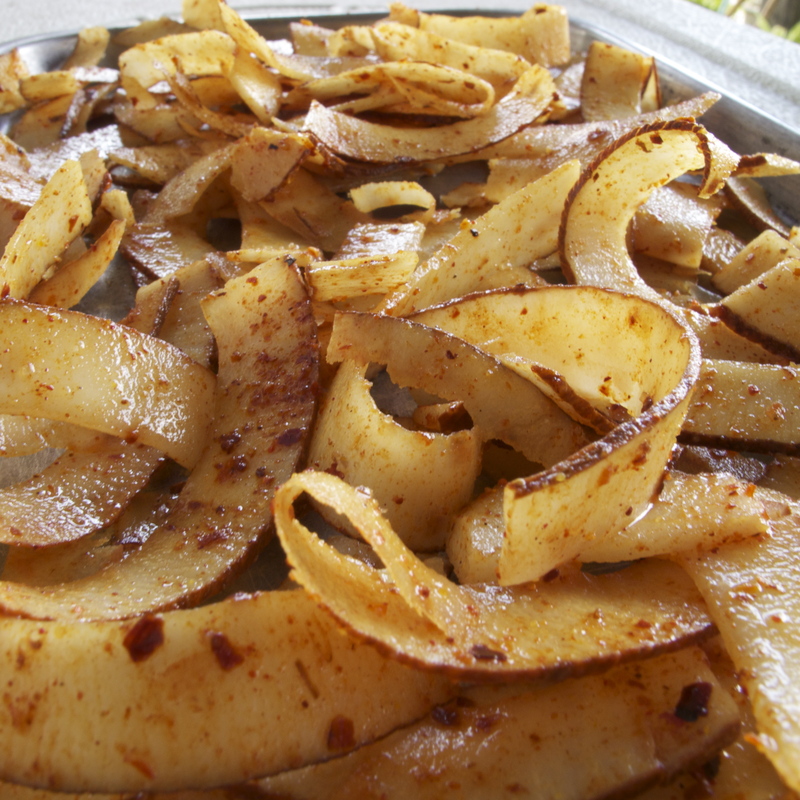 Place coconut chips in a baking sheet. Combine chili powder, turmeric, salt and lime juice in a large bowl or right on a baking sheet. The clue is crisp and dry and the coconut is almost brown. Preheat oven to 350º F. Line a baking sheet with parchment paper. Combine chili powder, turmeric, salt and lime juice in a large bowl. Mix in coconut chips and combine well. Spread coconut flakes in a thin layer on the baking sheet. Place in the center of the oven rack and stir every 4 minutes for 8 to 12 minutes, or until crisp and toasted. Recipe by Pranee Halvorsen, PCC Cooks instructor. Demonstrated on the PCC Cooks stage at Vegfest 2011. You also can see this recipe from PCC Natural Markets website. Here in Seattle, I have been savoring persimmons during all of November and now into December. Persimmons reached their peak this last week. The abundance of this fruit at peak season provides a low price and high quality sweet fruits and this is when I am inspired to cook with persimmons. 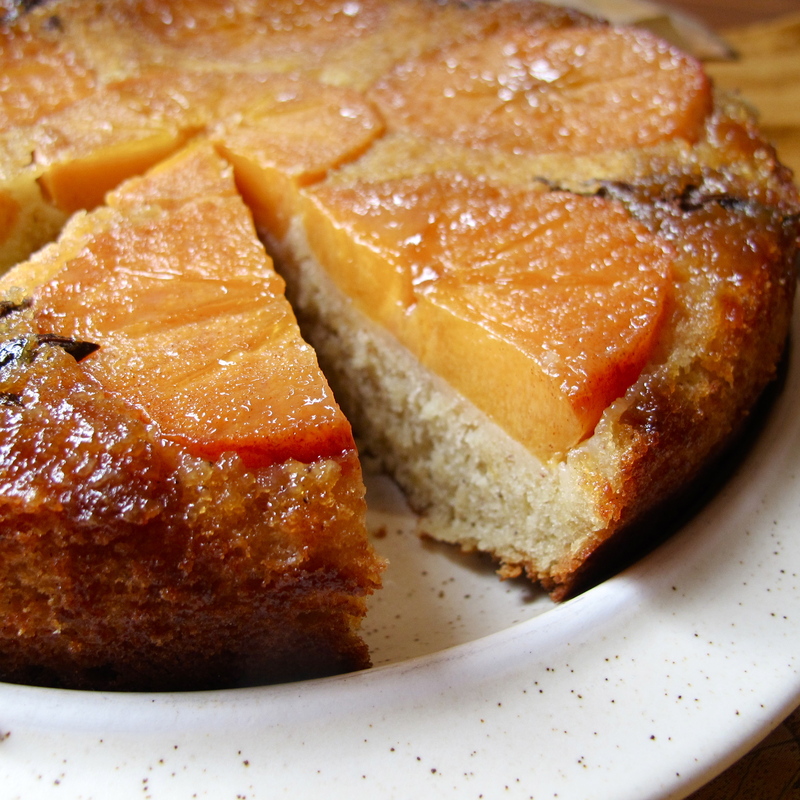 This year in my kitchen I found two delicious new ways to cook with them: persimmon-orange butter and persimmon upside-down cake. Today I will share with you my discoveries of this divine fruit which only appears once a year. 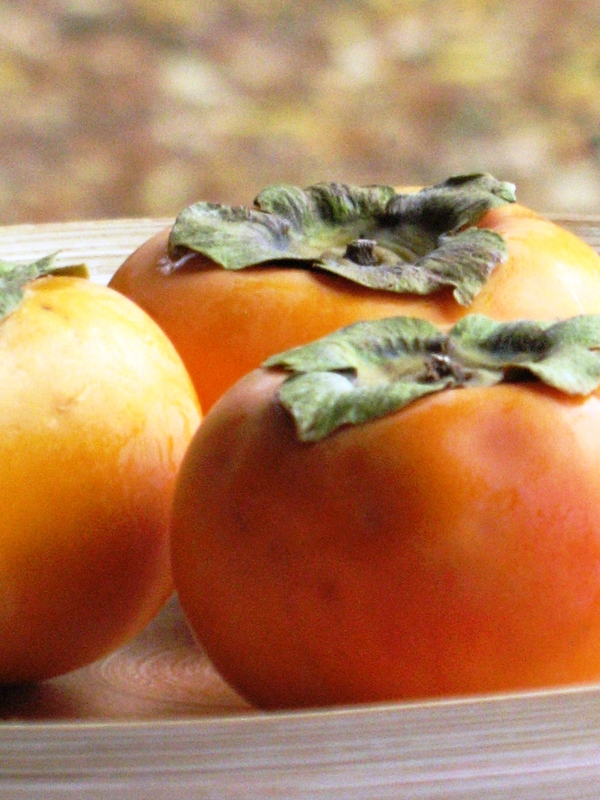 The yellow-orange color of persimmon and its aromatic sweetness make this fruit special. In the U.S., the season for persimmons is in November and December, and they give us a special way to celebrate the holiday seasons. 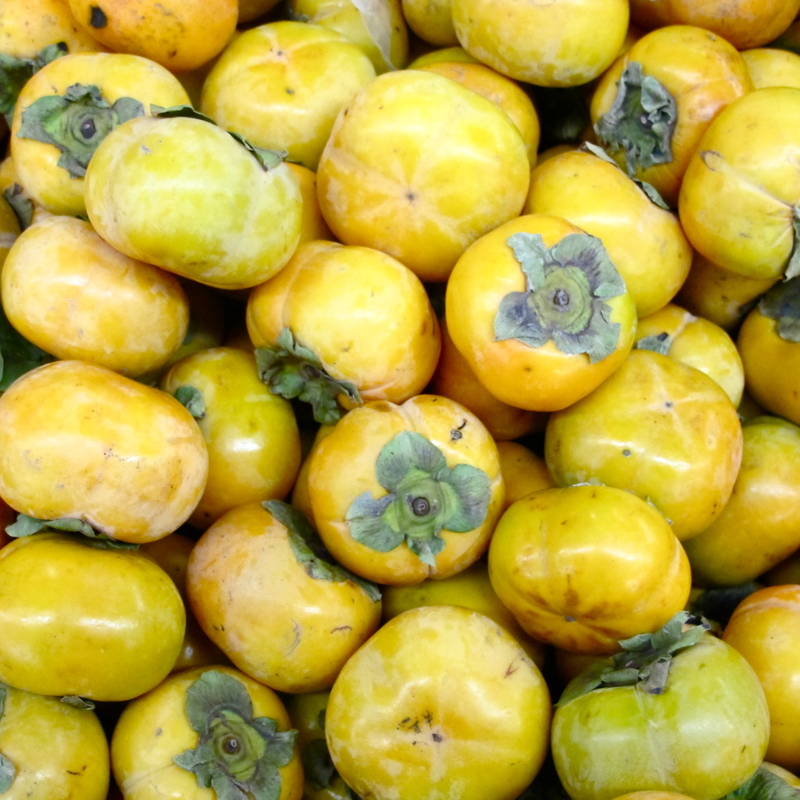 Persimmons arrived in the U.S. and Europe over 200 years ago. There are two varieties in Seattle market: Hachiya and Fuyu. The former is recommended to eat when it is fully ripe. The latter, Fuyu, is my favorite and it is the variety most commonly available, so my focus today will be on the Fuyu persimmon. Fuyu persimmons (Diospyros Kaki L) are native to Northern China. 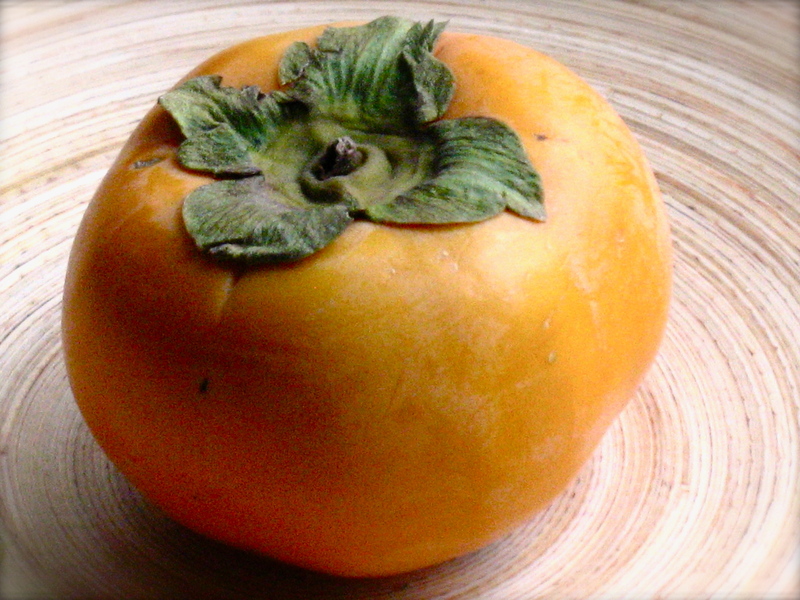 It is an ancient fruit—a fossilized persimmon was found in the tomb of the emperor of the Han Dynasty. Fuyu persimmons first traveled from China to Thailand in 1937, but they did not become widespread until the Royal Project Foundation under Kasetsart University conducted a study in 1969 that grew various varieties of persimmons in Thailand and led to the successful establishment of persimmon farming in Chiang Mai, Chiang Rai and Phetchabun. These are three persimmon varieties in Thailand: Xichu, Fuyu and Hyakume. (Source: 111 Thai Fruits by Nidda and Thaweethong Hongvivat published by Sangdad). 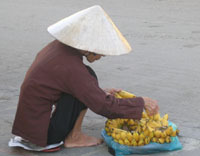 The season for harvesting them is from July till September each year. The nutritional benefits from persimmons are priceless. It is high in potassium, vitamin C, and much more. When the hint of green disappears from the skin and is replaced by a yellow-orange color, one can snack on unripe Fuyu persimmon, though the ripe ones are the best. Persimmons can accompany an assorted cheese platter, much like pears or grapes, or combining green salad with bacon. For dessert, last year I found my pleasure by adding persimmons in coconut milk to my pearl tapioca pudding just before serving. This year, in the process of creating a dessert for 70 people, I found myself preparing persimmon-orange butter to serve over sweet sticky rice. Then came persimmon upside-down cake; this was magically created right after baking cranberry upside-down cake for my family. For an impromptu inspiration, all we need is to have plenty of persimmons around while they are in season. You can use persimmon-orange butter on just about everything, or you can eat it plain like apple sauce. This is my favorite way: served with sticky rice, on top of peanut butter and fruit butter for the sandwich. Place persimmons, orange zest, orange, salt, sugar, cinnamon stick, triple sec and butter in a large saucepan. Let it cook on medium heat until softened and all juices from the fruit have evaporated, about 30 minutes. Stir often during the cooking. Remove cinnamon stick. 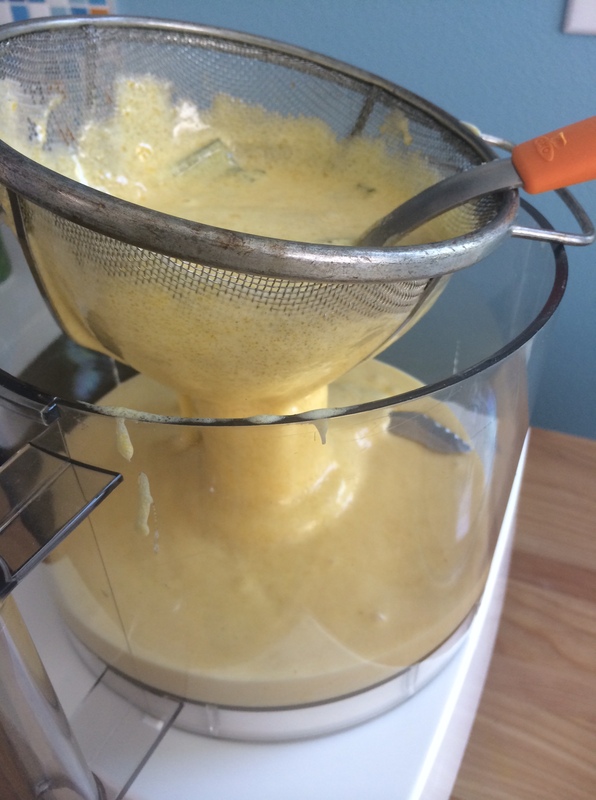 Pour the mixture into a blender or food processor and blend until smooth. Store in the refrigerator for up to two weeks. When I was looking for a spice to compliment the flavor of persimmon, I picked up my cinnamon powder from Vietnam and star anise powder from Thailand. After smelling the star anise, I decided it was a sure thing. At that moment my eye glanced over at the star-shaped center of the persimmon and I decided to place a star anise in between the slices of persimmon. The star anise mirrors the pattern of the star-shaped center of the persimmon. Perfect. I was also happy that I had some persimmon-orange butter that I had created on another day. 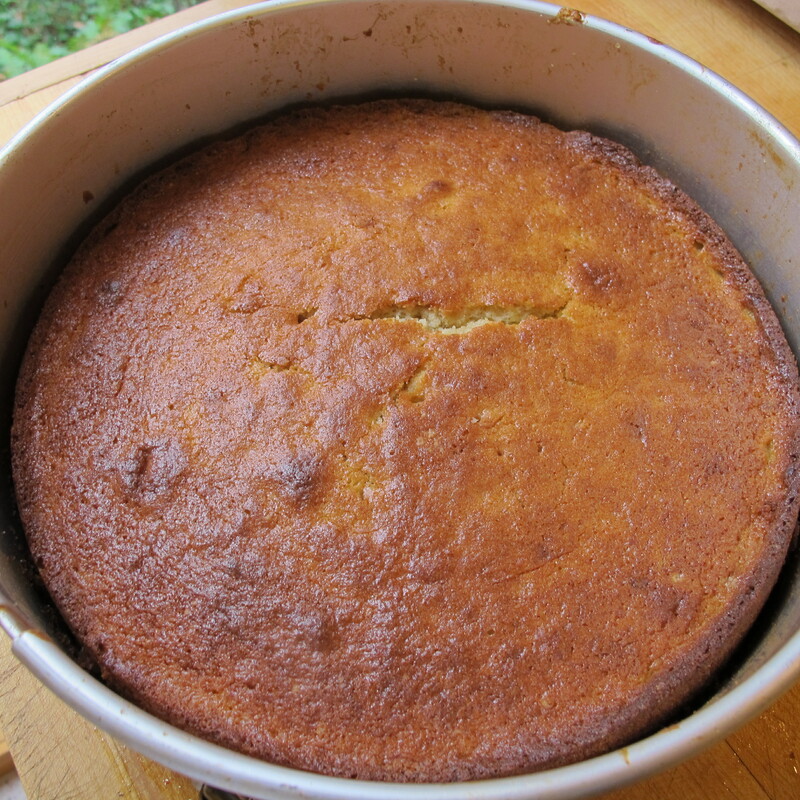 This allowed me to add some persimmon flavor in the body of the cake. I used organic brown sugar, but any brown sugar would do the work. 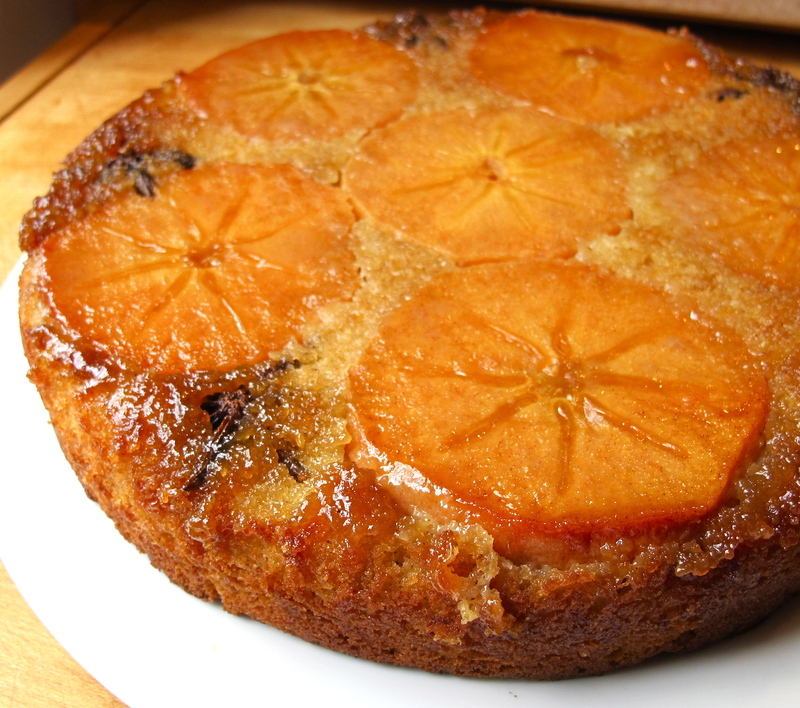 The pretty star-shaped centers creates a perfect look for this upside-down cake. Burnt brown sugar with creamy soft persimmons melt in your mouth, almost like a crème caramel. I baked Yankee Cranberry Upside-Down Cake many times last week, which is what led me to this project. 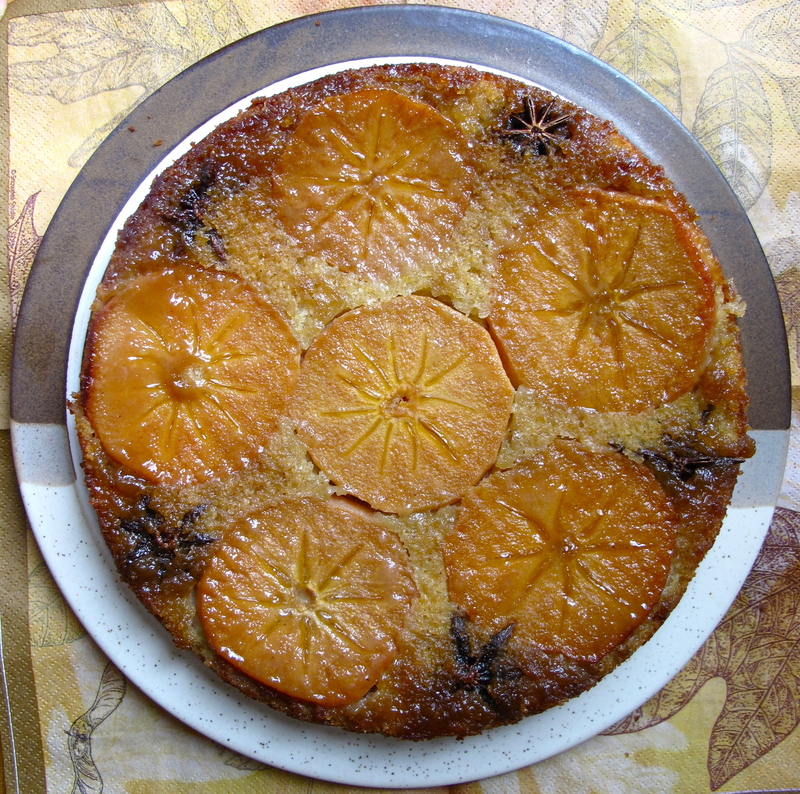 I played around with persimmons and spices I had in the kitchen, and by the time the cranberry upside-down cake was finished, my persimmon-star anise upside-down cake was ready to go in. It became totally a different cake with its own flavor profiles, but it was the Yankee Cranberry Upside-Down Cake that inspired me with confidence. Cover a 9-inch spring form pan with 2 tablespoons melted butter, then sprinkle with brown sugar, triple sec and ½ teaspoon star anise powder to cover entire surface. 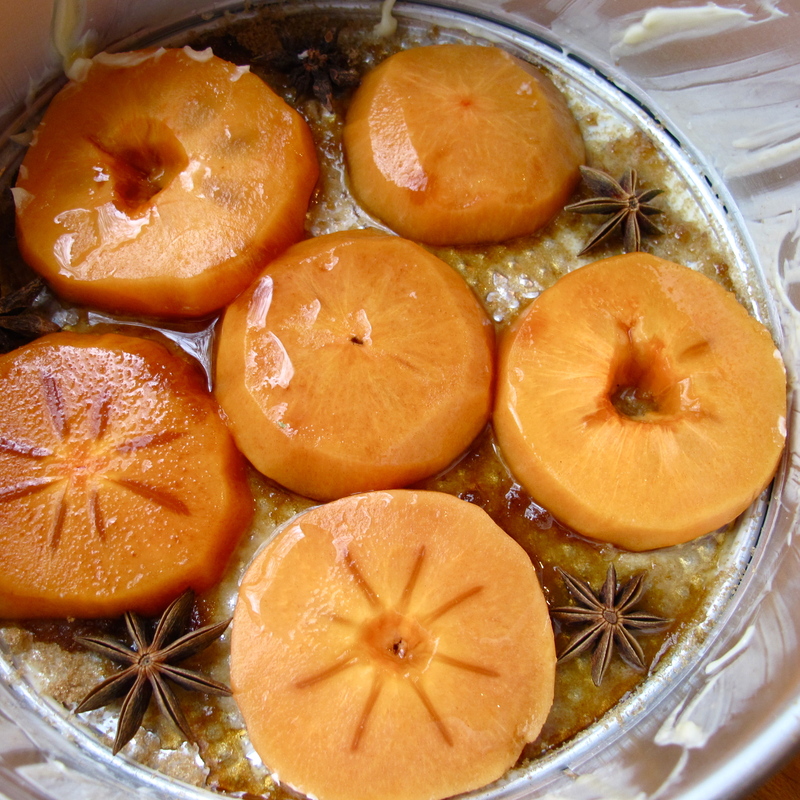 Arrange persimmon slices and star anise as shown in the photo above. Combine flour, baking powder, remaining star anise powder and salt. 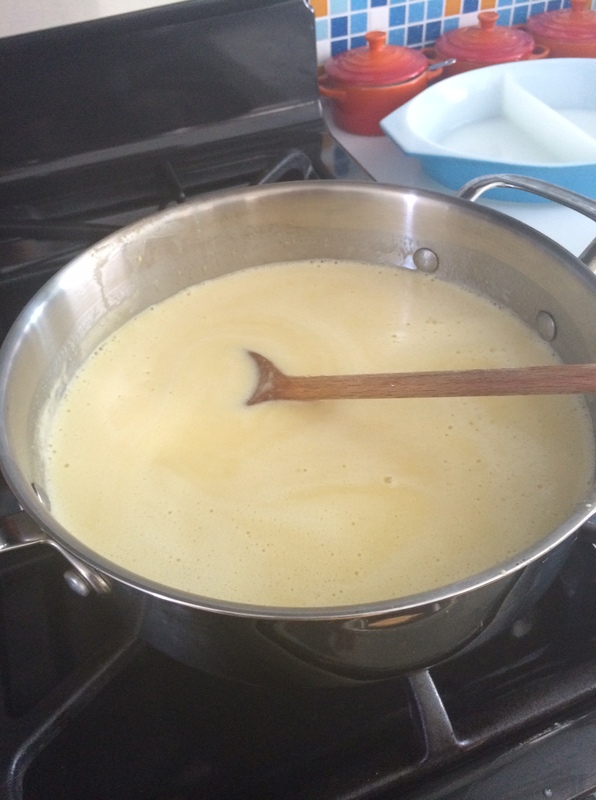 Beat the remaining 4 tablespoons butter and the sugar very hard by hand until they are well mixed. 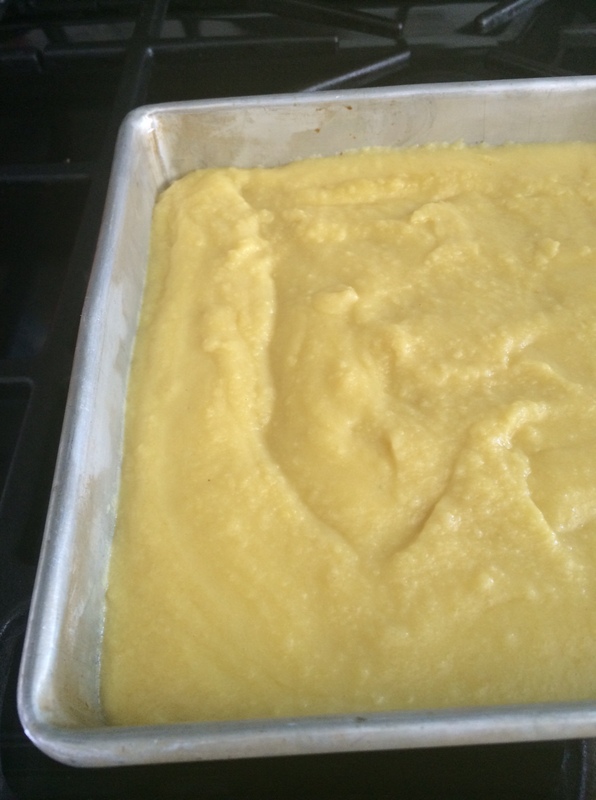 Then beat in eggs, one at a time, very hard by hand until the mixture is custardy. Whisk in ½ cup of the flour mixture, mix well, then whisk in ¼ cup buttermilk; continue this method of adding the flour and buttermilk until you finish with ¼ cup flour. Pour the batter into the center of the springform pan, smoothing it with a spatula to make it evenly cover the persimmon. Bake on a rack in the center of the oven until a wooden toothpick inserted into the center comes out clean, about 35 to 40 minutes. Let it cool for 5 to 10 minutes. While the cake is still warm, invert the cake onto a serving platter.